Hadrat Abu Talib, “The Greatest Guardian of Islam” died at the age of 80 years on 26th Rajab in Makkah, three years before Hijrah of the Holy Prophet (S.A.W.) from Makkah to Madinah. He strongly stood by Holy Prophet of Islam’s Divine Mission. He was always protecting him from the Quraishi polytheists in Makkah. In the month of Rajab three years before Hijrah, the Holy Prophet (S.A.W.) lost his guardian Hadrat Abu Taleb(A.S.) and Hadrat Khadija(A.S.), his beloved wife. It was a great tragedy for Holy Prophet (S.A.W.) who called that year as “The Year of Sadness”. 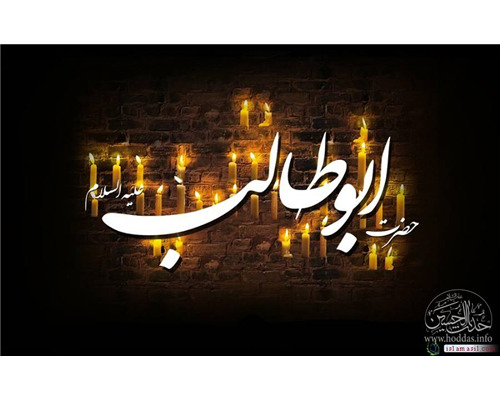 On the death anniversary of Hadrat Abu Taleb (A.S.), “The Greatest Guardian of Islam” we extend our Heartfelt Condolences to the 1800 millions strong Muslim Ummah.